After surveying the damage earlier today, NWS officials deemed the damage to the Belmont community of northwest Fayette County (a few miles southeast of Mason in Tipton Co) to be caused by a high-end EF-1 tornado with maximum sustained wind estimated at 105 mph. According to the damage survey, the tornado touched down at 9:13pm just northeast of Exit 35 north of I-40 in the Belmont community. It stayed on the ground for 5 minutes, lifting 1 mile east of the touchdown point at 9:18pm in a wooded area north of Old 59 Drive. 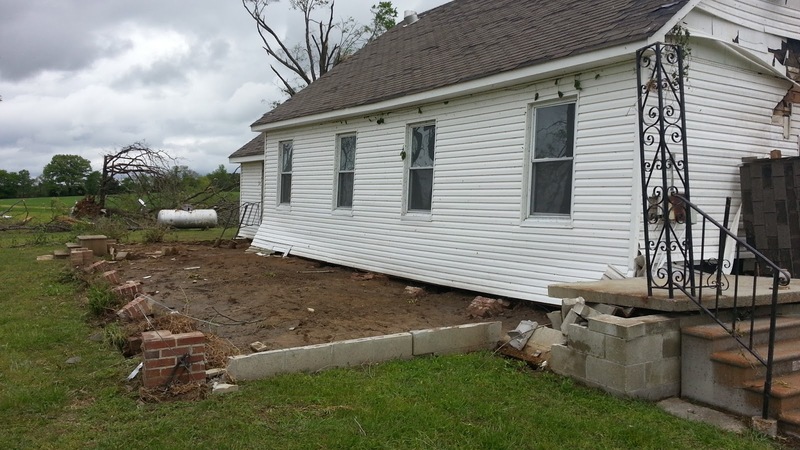 There was one minor injury in a residence near the end of the tornado path. Maximum wind was estimated at 105 mph with a path width of 250 yards (0.14 miles). The most significant damage was to a large barn that housed K9 Savior, where well over 100 animals were kept. This barn was about where the tornado touched down. In addition, many trees were uprooted or snapped and a rural church that was resting atop brick pilings just off the ground was moved about 15 feet off it's foundation at Belmont Cemetery on Old 59 Drive. 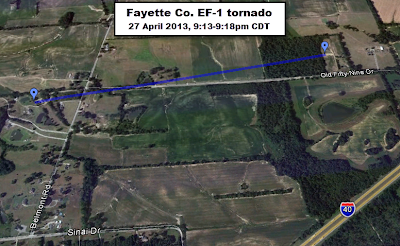 Tornado path (1 mile) of the Belmont tornado. Click here for KML file to view in Google Earth. 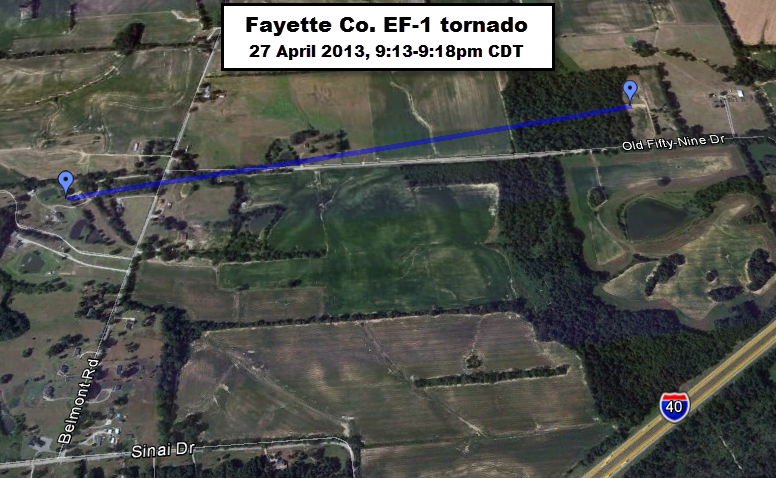 The entire area, including Fayette County, was under a Tornado Watch at the time. The National Weather Service issued a Tornado Warning for far southeast Tipton County and northern Fayette County at 9:19pm CDT that was in effect until 10:00pm. At 9:24pm, the Tornado Warning was cancelled for Tipton as the storm had left the county. The section of Fayette around where damage occurred was removed from the warning at 9:36pm as the storm had left that part of the county. The remainder of the warning was allowed to expire at 10:00. If you look carefully at the timeline above, you'll see that the NWS indicates the tornado was on the ground prior to the issuance of the warning. In fact, it was issued one minute after the tornado lifted, however strong rotation was still evident on Doppler Radar imagery of the storm well after the tornado had lifted. This is a sobering reminder of how storms can and occasionally do produce tornadoes, especially weaker ones, with little notice, especially when a Tornado Watch is in effect. A Tornado Watch means conditions are favorable for storms to produce tornadoes. People should keep a close eye to the sky and monitor local weather sources anytime storms are present, especially when a watch is in effect. A church at Belmont Cemetery was shifted about 15 feet off it's foundation. Click here for more pics on our Facebook page. It is certainly fortunate that no one was seriously injured or killed and that population density was low where the tornado struck, or damage would have also certainly been more extensive. Please keep those affected in your thoughts and prayers. 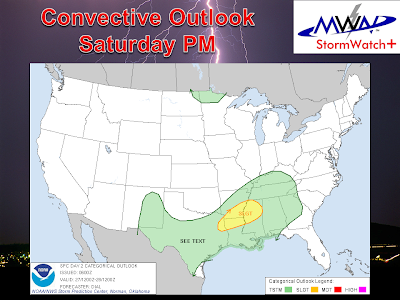 The Storm Prediction Center has placed the southern half of west TN, southeastern half of AR, and north MS in a Slight Risk this afternoon and evening, indicating an elevated threat of severe weather, including in the Memphis metro. The timing for potential severe weather will be from mid-afternoon through the evening hours. This threat is driven by an approaching low pressure system that will pass by just to our north. As it moves closer, a warm front will lift north of the area, putting the metro in the warm sector of the approaching low and increasing surface-based instability (a necessary ingredient for severe storms). The threat exists until the low moves by and drags a cold front through the region, which should occur by midnight tonight. We expect the event to unfold with scattered thunderstorms or clusters of storms forming over the Mid-South by 2-3 pm today and continuing into the evening hours, with a line of storms possible to end the event late this evening (8-11pm). The storms will bring the risk of straight-line wind of 60 mph, large hail, and an isolated threat for a tornado. The tornado threat is very low. The risk area and chance of each severe weather type is shown below and is valid as of 8am. A Slight Risk of severe weather exists today. The main threats are hail & wind. Click image to enlarge. If you have outdoor plans, particularly during the afternoon and evening, stay in close touch with local weather sources. 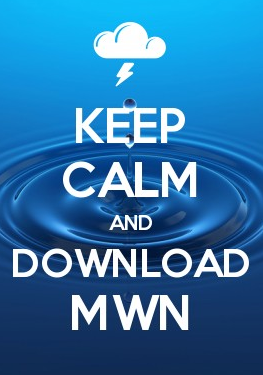 We highly recommend the use of our MWN mobile apps for radar and forecast information. If you haven't yet activated StormWatch+ in the MWN app, today is a good day to do so. It allows you to put in your specific locations of interest and get warnings and watches as they are issued for just those locations. There is no more precise or convenient warning system available anywhere and it's backed with support from a local, trusted, responsive source. Links to download our apps are below. As usual, we will provide regular updates via social media as storms form and until they leave the area, including threats posed, locations affected, and timing of any threats. Follow us on Facebook and Twitter at the links below. There are plenty of outdoor plans this weekend and, unfortunately, it looks like Mother Nature may get in the way of some of them. In fact, the Arlington in April and Southern Hot Wings Festival have both opted to move to their rain dates on Sunday. The Southaven Springfest at Snowden Grove will continue as scheduled at the time of this writing, including the Dave Matthews concert Saturday night. And of course, YOUR Memphis Grizzlies play the hated L.A. Clippers on Saturday afternoon at FedExForum. So, here's what to expect. Low pressure will develop over the southern plains and move in our direction late today through Saturday. There will be a chance of showers late this afternoon and evening, but the bulk of the rain (and it could be heavy at times) will fall late tonight through Saturday morning. Rainfall amounts could exceed an inch during this period and steady rain may not taper off until late morning. As the low pressure system approaches, more unstable air will work it's way into southern parts of the Mid-South, mainly over north MS, Saturday afternoon and evening. As the low moves nearly overhead, scattered thunderstorms are expected to fire during the afternoon, especially if breaks in the clouds allow temps to climb into the mid 70s or higher. Not everyone will likely see storms, but there is a 50/50 chance of them occurring during the afternoon and evening. 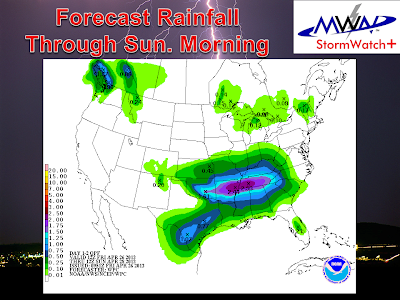 Much of the Mid-South could see up to 2" of rain by Sunday morning from the weekend system. The Storm Prediction Center indicates that some of these storms over north MS in particular could become severe and has outlined areas south of the TN-MS state line in a slight risk. There is not a high chance of severe weather, but the threat is elevated somewhat in the warm sector of the low pressure system. Hail and damaging wind are the threats from any strong storms. The activity should decrease in intensity and then move out overnight Saturday night and Sunday looks to be a partly sunny, but dry, day with highs back in the mid 70s. 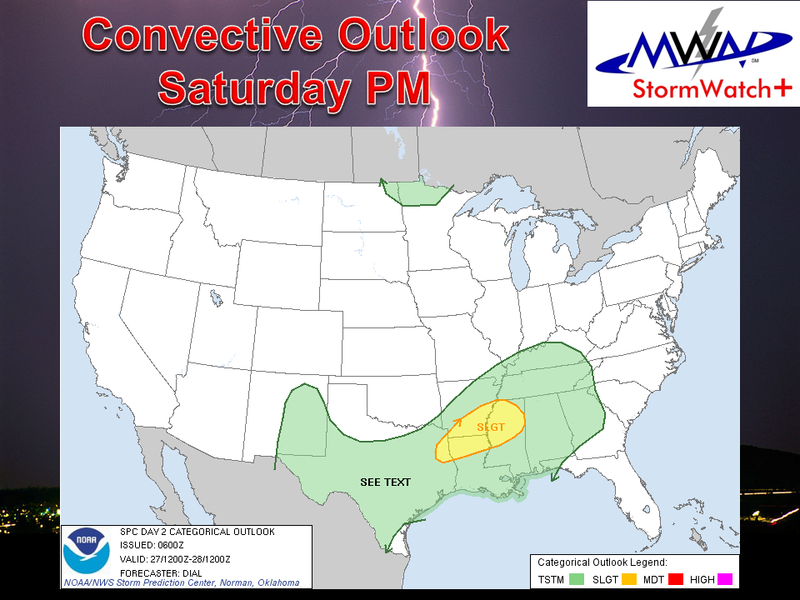 A Slight Risk of severe weather exists Saturday afternoon/evening over north MS, south AR, and north LA. MemphisWeather.net intends to nowcast on our social channels below during periods of inclement weather, particularly periods of storms. 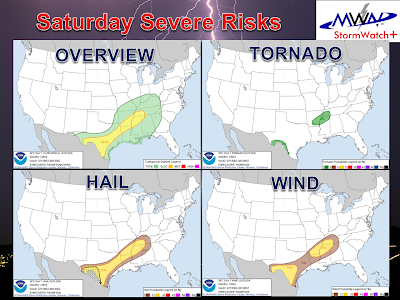 While you're out and about this weekend, keep an eye on our Facebook and Twitter streams and be sure to download our MWN mobile app for Android and iPhone for the latest radar, forecast, and severe weather information via StormWatch+. You will also find download links below. 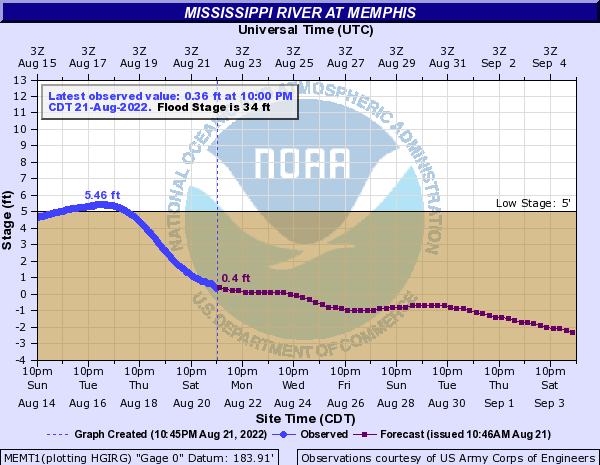 WATER LEVELS ALONG THE MISSISSIPPI RIVER ARE FORECAST TO CONTINUE RISE OVER THE NEXT FEW DAYS. 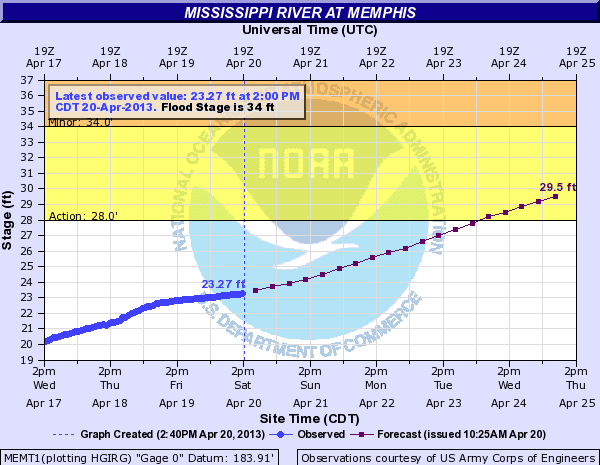 THE MISSISSIPPI RIVER AT MEMPHIS IS FORECAST TO REACH 32 FEET ON WEDNESDAY MAY 1ST....WHICH IS BELOW FLOOD STAGE OF 34 FEET. 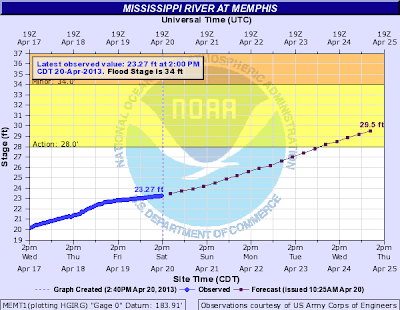 NEVERTHELESS...FORECAST MISSISSIPPI RIVER WATER LEVELS WILL CAUSE RISES ON THE TRIBUTARIES IN SHELBY COUNTY...NOTABLY THE LOOSAHATCHIE RIVER...WOLF RIVER AND NONCONNAH CREEK. ANY TRIBUTARY RISES WILL BE NOTED IN LOCATIONS CLOSEST TO THE MISSISSIPPI RIVER AND WILL CAUSE WATER TO FLOW INTO TYPICAL LOW-LYING AREAS ALONG THESE TRIBUTARIES. 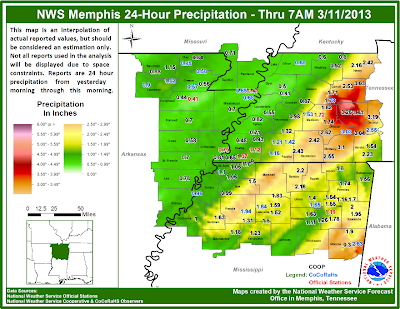 THIS WEEKEND RAINFALL OF 1 TO 2 INCHES IS EXPECTED ACROSS THE MEMPHIS METRO AREA. THIS MAY CAUSE ADDITIONAL RISES ON THE TRIBUTARIES...HOWEVER FLOODING IS NOT EXPECTED IN BUSINESSES OR HOMES. THE NATIONAL WEATHER SERVICE AND SHELBY COUNTY OFFICE OF PREPAREDNESS IS CAUTIONING THOSE WITH INTERESTS...OFTEN RECREATIONAL...IN THESE LOW LYING AREAS TO PAY ATTENTION TO RIVER LEVELS. IN ADDITION... STAY TUNED TO THE LATEST FORECAST IN CASE MORE RAIN THAN FORECAST DOES FALL CAUSING ADDITIONAL RIVER LEVELS TO FURTHER RISE. As mentioned in the previous post, there is nothing to indicate that we re going to experience anything close to the historic levels we saw in 2011. In fact, the crest of 32' on May 1 is expected to be followed by falling water, which will be well within the natural boundaries of the river about 10 days later. However, if you head down to the river early next week, you'll notice that most land on the west side of the river will be covered by water, as far west as the West Memphis levees. The latest hydrograph for the Memphis river gauge is below. It's spring and that means the annual water rise on the Mississippi River is underway. Thanks to rainfall in the middle Mississippi and (mainly) Ohio Rivers and some snow melt upstream, the river gauge at Memphis has begun it's climb. Wolf River Harbor with the Mississippi River at 35.6', which is higher than currently forecast. Also, it is important to note that forecasts are based on past/recent rainfall, forecast rainfall for the next 24 hours, and runoff from snow melt upstream. Any additional rainfall upstream could significantly affect river stage forecasts. The latest 28 day river stage forecast (released weekly) does not indicate significant flooding, so there is no reason to expect that we'll see the type of water we experienced 2 years ago when the foot of Beale Street went under and national media were wading on Riverside Drive! The one good thing that should help keep the river stages somewhat in check (unless significant rainfall occurs in the Ohio River Valley in the next 2 weeks) is that there is not a lot of existing snow in the Upper Mississippi River basin. 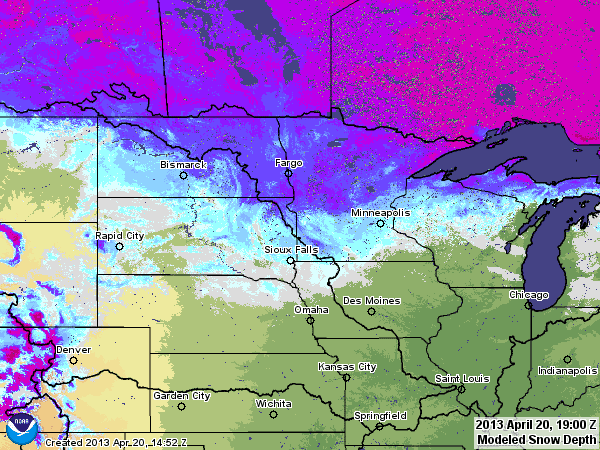 Snow is confined mainly to the Dakotas, MN, and northern WI. Existing snow (colored by depth) in the north-central U.S.
25'- Roads along the river south of Shelby Forest are beginning to go under water. Fields begin to flood in extreme southwestern Shelby County near North Horn Lake. 27' - Water is beginning to touch the levee between I-40 and I-55. Much of the land between Memphis and West Memphis is flooded. 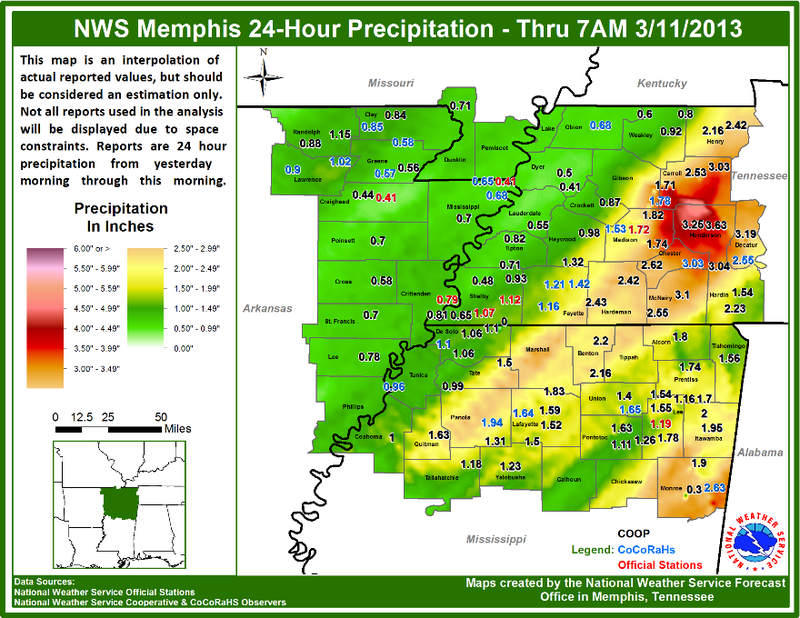 32' - Most all land between Memphis and West Memphis is under water. Levee has water on it west of President Island south to Blue Lake. More information on the river stage, forecast, and effects from flooding at Memphis can be found here. In addition, the daily river stages can also be found on this page on MemphisWeather.net. ADVISORY...WHICH IS IN EFFECT FROM 1 AM TO 8 AM CDT SATURDAY. 30S. FROST MOST LIKELY TO OCCUR IN SUBURBAN AND RURAL AREAS. * TIMING...1 AM THROUGH 8 AM CDT. HARM OR KILL SENSITIVE VEGETATION. A word on today's forecast "bust"
Sometimes Mother Nature throws a curve ball. Despite multiple days of buildup based on weather computer models that printed out scenarios involving severe storms with damaging wind and possible tornadoes, tonight's cold front has come through with little fanfare. In fact, by late afternoon, the atmospheric setup was so borderline, a watch box was not even issued for most of the metro. This after two days of Moderate Risks, hatched areas, and 45% risk zones. Was it hype? No, absolutely not. Was any preparation you might have made for naught? I would think not. Meteorologists take the information they are given, combine it with their knowledge of the atmosphere and, in many cases, years of experience in a region, and put together their best forecast. Typically, that forecast is pretty darn close to what actually happens, especially in the first 3 days or so. Sometimes, despite the latest technology and years of experience, we bust. Today, despite getting most parts of the forecast right, the expected intensity of the storms was way over-done, at least in this part of the Mid-South. We messed up! One of the key problems: too many clouds contributed to too little instability. There just wasn't enough "juice" to fire up the storms to severe intensity. Many of you are OK with that - you don't like severe weather anyway. For those of us in the business, we learn from it, add it to our case studies, and move on. We'll bust again sometime down the road. But hopefully there will be some home runs before then. In the meantime, enjoy the pollen wash and promise of reduced post-frontal humidity. Just don't accuse your local weather guy (or gal), or the NWS or Storm Prediction Center, of hyping or creating a mountain from a molehill. We didn't say "tune in at 10 to find out whether you'll live to see tomorrow," we simply provided the best forecast we could based on the information we had to work with. In this case, Mother Nature decided to throw that curve ball. We'll gladly step up to the plate and take another swing in the next at-bat. A Slight Risk zone continues across the entire area as storms begin to enter the western portions of the metro. Fortunately, no storms have prompted severe thunderstorm warnings any time recently. An atmospheric sounding taken near Cleveland, MS (in the MS Delta) by a Mississippi State University team indicated that instability over the area was poor, contributing to the lack of strength in the storms, however wind shear was still very high. We'll see if a new watch box is issued. In the meantime, the east AR box is scheduled to expire at 5pm. The Storm Prediction Center has dropped the entire Moderate Risk area in favor of a high-end Slight Risk as the storm system is not panning out to be as intense as forecast. The Mid-South can still expect to have a straight-line wind threat, along with possible hail and an isolated tornado (as wind shear remains as a favorable ingredient that is in place). 3pm Convective Outlook drops the Moderate Risk in favor of a Slight Risk for the entire region. 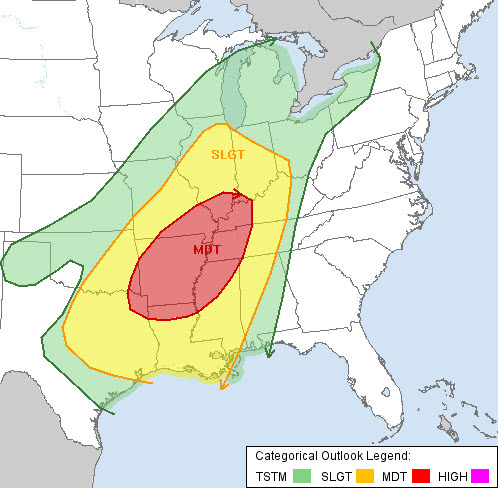 The NWS in Memphis is downgrading the Moderate Risk to a Slight Risk. While the threat of strong to severe storms is still present, it does not appear to be high enough to support a moderate risk any longer. A potent line of storms is still expected during rush hour. Reference the NWS (technical) forecast discussion for more. Although the tornado threat is not particularly high with this event, wind shear in the atmosphere is sufficient to support tornadoes should they form, thus we expect a Tornado Watch to be issued very soon. The main threat continues to be damaging straight-line wind with a squall line that is marching towards the area from AR. MWN StormView Radar shows storms moving east into eastern AR at 2:09pm. We expect this line to reach the Mississippi River around 5pm and continue moving east through the metro. Rush hour will see torrential rain, possibly areas of standing water, the threat of strong gusty wind, and dangerous lightning. If you can leave early, it's probably a good idea to do so. In addition, Memphis City Schools has cancelled all after-school activities due to the threat of inclement weather. This is a good move. If you have activities planned outdoors this evening, follow suit and cancel them. Severe weather is likely in the Mid-South today. We've covered the reasons in previous posts. Today, we focus on what will happen and when. Time permitting, this post will become a live blog with updates as new information is released from NWS-Memphis and the Storm Prediction Center. For the latest, follow us on Facebook and Twitter though. Of course the MemphisWeather.net website will also have current info, especially in the MWN Storm Center, where watches/warnings, SPC products, etc. are updated in realtime. 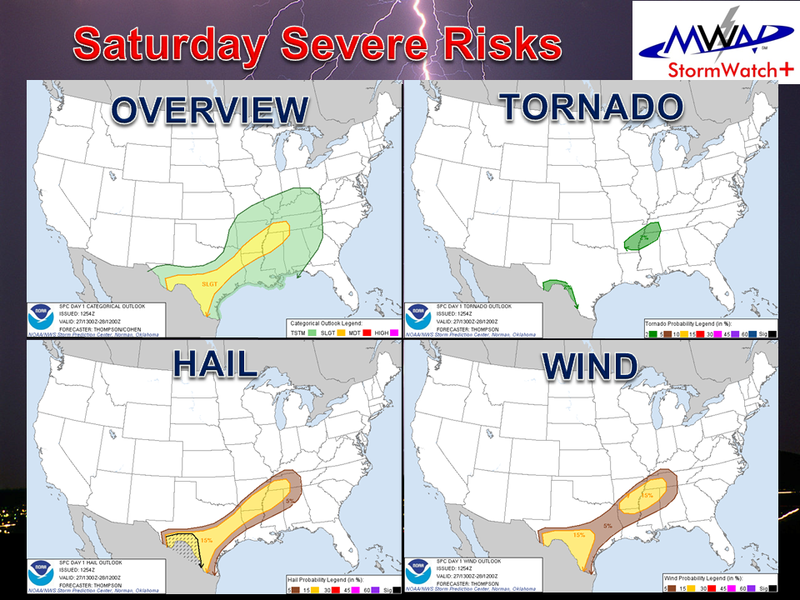 As of 10am, the entire region is under a MODERATE RISK of severe weather with significant severe storms possible. A Moderate Risk implies substantial severe storm coverage, or an enhanced chance for a significant severe storm outbreak. It also implies a greater concentration of severe thunderstorms, and in most situations, greater magnitude of severe weather and greater forecaster confidence as compared to a Slight Risk. Below are the SPC graphics for today, issued at 8am. They will be updated a couple of times during the day. Probability of tornadoes. The metro is in the 10% area, which is fairly high for tornadoes, and also in the hatched area, indicating a few tornadoes could be intense (EF-2+). Probability of damaging wind. The metro is in the 45% area, which is high. Basically, our chance is nearly 50/50 of seeing 60 mph+ wind today. Scattered storms will be possible in the metro, though mainly in eastern AR, after about 3pm. These storms could become supercells, producing strong wind, hail, and a few tornadoes. They will be moving to the northeast at about 35-45 mph. West of any scattered cells, a squall line will be moving east into the metro between 5-8pm. This is the most likely time for severe weather. The squall line will be capable of producing damaging wind of 60-75 mph, hail, and isolated tornadoes as well. The predominant threat today is straight-line wind damage from the squall line. Rain, occasionally heavy, will continue through the evening behind the main line, tapering off by midnight. Lightning will also be possible throughout the evening. Flash flooding is a concern as some places could see 1.5"-2.0" of rain in a few short hours. Any storms that move over the city between 4-6pm could produce urban flooding on local streets and make rush hour travel difficult. This is likely the greatest risk from severe weather that we have faced since early last spring, before it got hot and severe weather threats shifted well north of us. Have a severe weather plan in place and ready. Prepare for the likelihood of very strong wind and possible tornadoes, including during rush hour. We highly recommend proactively cancelling all outdoor activities scheduled after 5pm. Charge your cell phones before you head home from work if possible. Keep ID on your person at all times. Prepare for the possibility of power outages that could last into the night if they become widespread. Have your safe place ready. This should include a way to monitor the weather, flashlights, activities for the kids for a short time (with fresh or charged batteries), and bicycle helmets for the kids (to protect from any falling debris). Don't count on outdoor warning sirens to warn you of possible tornadoes! You probably won't hear them, even though you think you will. NOAA Weather Radio, local media sources and smartphone apps should be your primary sources of severe weather information. We highly recommend StormWatch+, found in a stand-alone app for iPhone/iPad as well as in the MemphisWeather.net app for Android and iOS devices (links below). Above all, BE PREPARED, NOT SCARED. A Moderate Risk zone covers the metro for Thursday afternoon/evening. 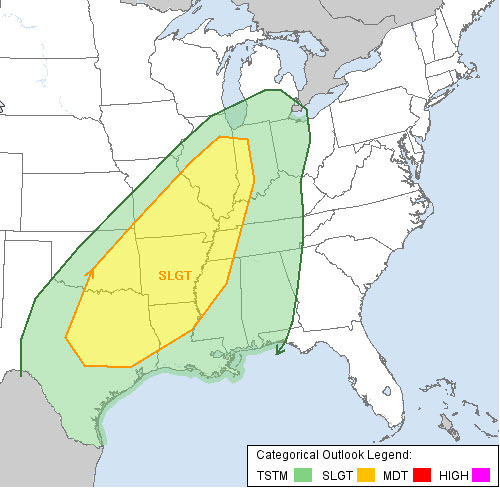 In fact, as indicated in the second graphic, SPC places us in a "45% hatched" area, as we say in the business. This means that there is at least a 45% chance that severe weather will occur within 25 miles of any point in that area, given the current forecast data. The "hatched" region is where there is a 10% or greater risk of significant severe weather. 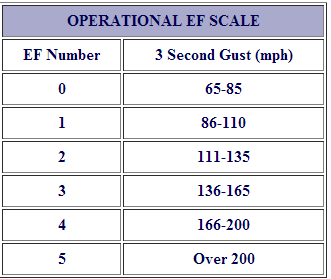 Significant severe weather is defined as EF-2+ tornadoes, 75+ mph wind, or 2"+ hail. A 45% hatched area covers the metro, indicating a 45% chance of severe storms and a 10% risk of significant severe weather within 25 miles of any point. Most of Thursday (during the day) will be like the past couple of days - windy, warm, and muggy with highs in the lower 80s and an isolated shower. By mid to late afternoon (probably after 3-4pm), a few thunderstorms could develop ahead of a squall line that will be moving across Arkansas. These early storms will grow in a very unstable and humid environment and could quickly become severe. Any discrete cells pose a risk of hail, damaging wind, and tornadoes. By early evening (5-7pm), the squall line will move into the metro from west to east. The main threat from the line of storms will be damaging straight line wind and perhaps large hail. Isolated tornadoes are also a possibility in the line. Rain, perhaps heavy at times, will follow the squall line for a few hours with most precipitation done by midnight or shortly thereafter. Mid-Southerners should have their severe weather safety plans ready and reviewed prior to severe weather occurring. Know where yo will go and what you will do if severe weather strikes while you are at work, home, or on the road. Most storms should occur after school hours, though rush hour could be affected. If you have outdoor plans Thursday evening, plan appropriately. Most outdoor activities should probably be proactively cancelled due to expected heavy rain and lightning. You should also know where you will get your severe weather information given your plans and the timing. We will be nowcasting all severe weather on our social channels listed below. Also plan to have your cell phones charged before heading home from work. If you have the MemphisWeather.net mobile app, now is the time to go ahead and spend the few extra dollars to add StormWatch+ to your app in the Alerts tab, then program in the locations you want alerts for. You'll automatically receive push notifications as soon as a watch or warning is triggered for your SPECIFIC location(s). Links to our apps are available below as well. One week after our last round of storms, which was expected to bring high round and isolated tornadoes, another squall line scenario is in the forecast for Thursday evening. Last week's front moved through slowly, with thunder for several hours overnight Wednesday night and rain much of the day Thursday. This week's front will be much more progressive. No, it has no interest in social reform - that simply means it will be moving much more steadily across the region, which will result in conditions improving faster behind it! Before it gets here, a potentially significant severe weather outbreak will unfold tomorrow afternoon and evening across the Southern Plains, especially from Branson, MO to Oklahoma City to Wichita Falls, TX. Tornadoes, large hail, and damaging wind are all possible in these areas. As the cold front begins to move into western areas of the Mid-South (AR) overnight Wednesday night, storms should form into a squall line. Locally, the cold front will likely move through the metro Thursday evening. In fact, output from 3 models valid at 7pm Thursday, are below and all are in generally very good agreement on the timing of the precipitation. Scattered storms are possible ahead of the front Thursday afternoon, which the NAM seems to pick up on moreso than the other models. However the main event will occur after 7pm with rain lasting for maybe 6-8 hours total, making for a dry rush hour Friday morning (though streets could be wet from overnight rain). 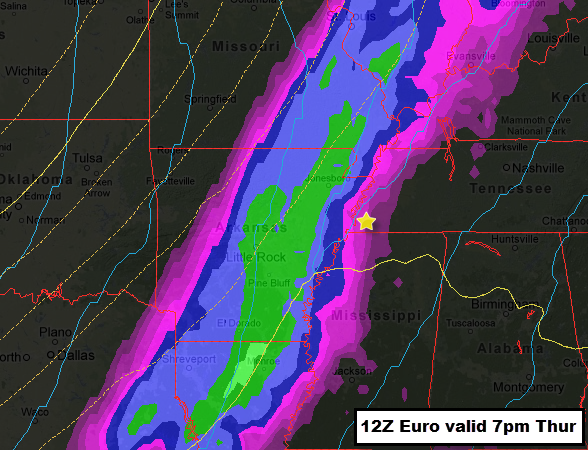 Forecast precipitation from the European model for Thursday late afternoon. In this, and the model output below, the leading edge of the heavy precipitation is near the MS River by 7pm. 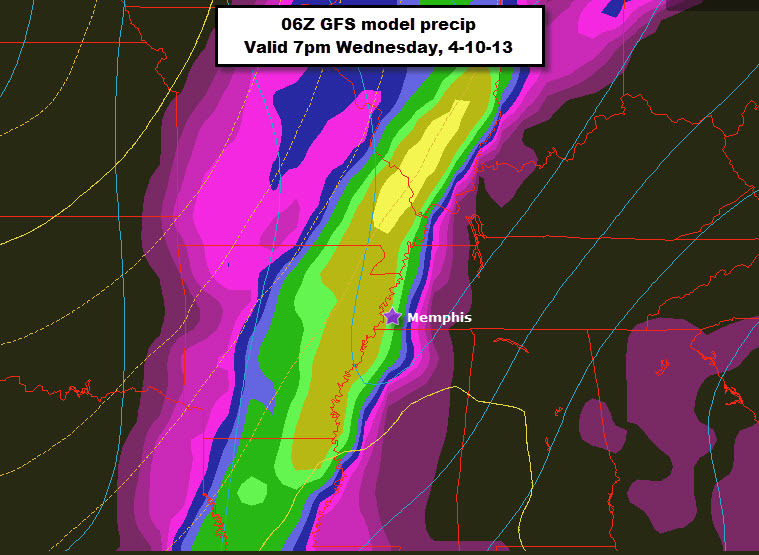 Forecast precipitation from the GFS model for Thursday late afternoon. Very similar (though with higher amounts) than the European. 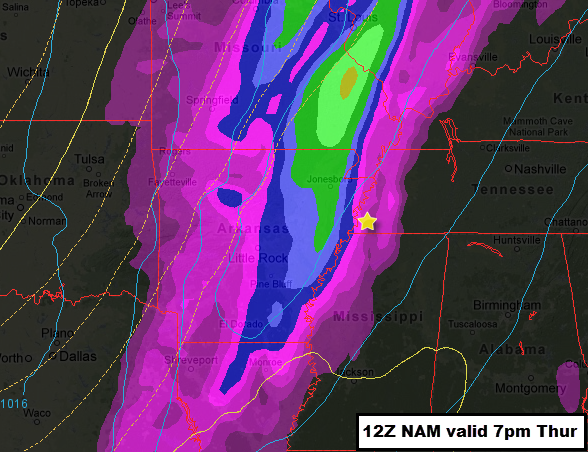 Forecast precipitation from the NAM model for Thursday late afternoon. The NAM seems to be picking up on some afternoon storms ahead of the main line. The primary severe weather threats will be damaging wind from a squall line, some large hail, and isolated tornadoes. In addition, though "progressive" in nature, abundant moisture from the Gulf will cause torrential downpours, which can lead to possible flash flooding under the heaviest storms. Probability of severe weather within 25 miles of a point. The chance is 30% in the metro. Forecast rainfall amounts from NOAA for Thursday 7pm through Friday 7am indicate well over an inch in the metro. We'll have more on the threats and updated timing as the system draws near. In the meantime, with our second severe weather setup in 8 days, we're definitely into the heart of severe weather season. Keep your safety plans fresh and practiced! We'll keep you updated on social media. You should download our mobile app and activate StormWatch+ for immediate push notifications of impending severe weather with street-level detail! More on our offerings below. Tornado Watches have been issued for most of Arkansas except the Ozarks, southeast MO north to St. Louis, and much of southern IL as the much-anticipated and discussed spring storm system marches towards the Mid-South. This will be a brief update to yesterday's blog with a "final call" on what to expect in the metro. Current watch boxes. Red = tornado. Blue = severe thunderstorm. Timing: While scattered cells are possible, mainly in the areas mentioned above, during the evening hours, the main line of storms will likely reach the Mississippi River between midnight and 2am and move slowly across the metro. Steady, occasionally heavy, rain and embedded thunder will be likely for several hours after the line moves through. A wet Thursday morning rush hour is likely. Threats: The primary threat with a squall line such as this will be strong and gusty, perhaps damaging, straight-line wind of 40-60 mph. In any storms that form ahead of the line, tornadoes will be possible, though that threat should be minimized in the metro. Occasionally, weak, brief spin-up tornadoes form in squall lines as well, so that threat is not non-existent. Large hail will also be possible is any storms and flash flooding could occur in areas that get a couple of inches of rain in a few hours or less. Prepare: Plan to have fresh batteries in your NOAA Weather Radio and your cell phones charged during the evening hours tonight. You want both working throughout the night. Make sure your "safe place" is clean just in case a Tornado Warning is issued. It's also best to have a flashlight or other non-electric power source near your bed in case the power goes out while sleeping. Shoes and photo ID should be nearby in case you need to move to shelter. We also recommend a smartphone app solution to wake you up in the event a severe storm is heading for your location. StormWatch+ is ours and works well on Android and iOS devices. Check it out below. Overall, the threat of an "outbreak" is low, but it's still best to be prepared. MWN will provide constant updates throughout the event tonight so follow us on Facebook and Twitter for the latest. If you don't get all of our updates on Facebook (they like to show you some things and not others), check out this Facebook graphic. 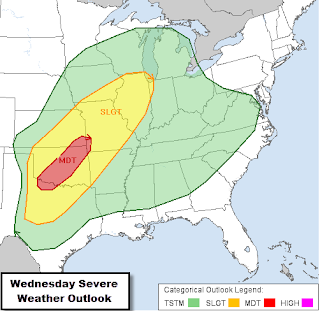 Severe weather remains a concern Wednesday night for much of the area. Though models are getting very close to agreeing on the main concepts, fine scale details are still to be determined. 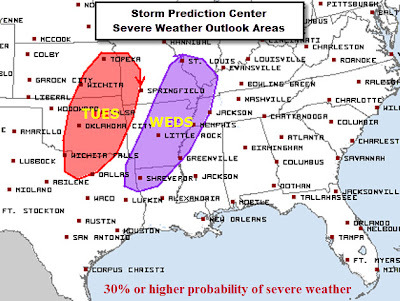 Below is a probability map showing the chance of severe weather on Wednesday and Wednesday night, as issued by the Storm Prediction Center. The entire region continues to be under a Slight Risk of severe weather, though the probability map highlights those areas that are more likely to see severe storms. The eastern half of AR right up to the Mississippi River, southeast MO, and extreme southern IL are under a 45% risk area, meaning there is nearly a 50/50 chance that severe weather could occur within 25 miles of people living in that region. The west TN and northwest MS portions of the metro have a 30%+ risk of seeing severe weather within 25 miles. This is, of course, subject to change as the new outlooks are posted beginning early Wednesday morning. As for timing and severe weather risks, the models have come to a consensus that the cold front will move through the metro sometime between about midnight and 6am Thursday. The solutions vary from 1am-4am along the river. Just ahead of the cold front, we expect to see a squall line (or QLCS - quasi-linear convective system) move through. This line will bring the primary severe weather threat, which will be a period of strong to possibly damaging thunderstorm wind of 40-60 mph+. Some hail is also possible with the line. It is also possible, especially in the 45% risk area, to have brief "spin-up" tornadoes embedded within the line. These types of QLCS tornadoes generally last just minutes and are typically weak (although 80-100 mph "weak" tornadoes in the right place will definitely do some damage). Ahead of the line, scattered showers and thunderstorms are possible beginning during the afternoon and lasting into the evening hours. Severe weather is generally not expected with these, although brief gusty wind and small hail are possible. Following the line, thunder will likely continue to rumble deep into the night, but the main threat behind the line will be torrential rain that could produce minor flash flooding. Rain will continue into the morning hours Thursday, tapering off by afternoon, and produce rainfall totals of upwards of 2-3" for the event. Mid-Southerners should be prepared for the possibility of severe weather, mainly high wind, during the overnight hours on Wednesday. This could include the chance of power outages. Have multiple ways of getting severe weather information at night, even if you are asleep. NOAA Weather Radios and smartphone apps are our top 2 suggestions. Notice outdoor warning sirens are NOT a preferred method. You likely won't hear them if the wind is howling and rain is pouring down, plus they won't go off for 60+ mph straight-line wind from a severe thunderstorm, only tornado warnings. Our recommendation for a smartphone app is the MemphisWeather.net app with StormWatch+, which will alert you (and wake you! ), but only if your location is threatened by severe weather. It's street level alerts in the palm of your hand! MWN will provide overnight coverage of the storms on our social networks listed below with our highly-acclaimed wall-to-wall severe weather nowcasting as long as there is a threat of severe storms. As we blogged on Saturday, the Mid-South is under the gun for severe weather conditions on Wednesday night. Multiple days of warm southerly wind and temperatures at or above 70 degrees (in fact, we could near 80 on Tuesday and Wednesday) will set the stage as a strong cold front pushes through the region late Wednesday night. The Storm Prediction Center has placed the entire region in a Slight Risk for severe weather. (What is a Slight Risk?) In fact, the slight risk (map below) encompasses most of the Mid and Lower Mississippi Valley, part of the Lower Ohio Valley/Midwest and central Gulf Coast as severe storms are possible from Indianapolis to Houston. 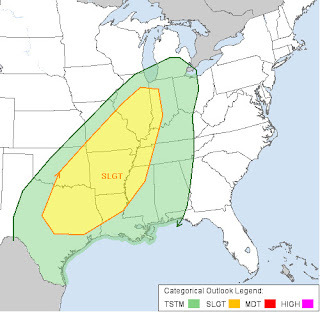 A Slight Risk encompasses a huge section of the Mississippi Valley, including the Memphis metro, on Wednesday. The Storm Prediction Center also issues probability maps, including the chance of experiencing severe weather within 25 miles of any location. Below, the Wednesday probability map shows that there is at least a 30% chance of severe weather in the metro. 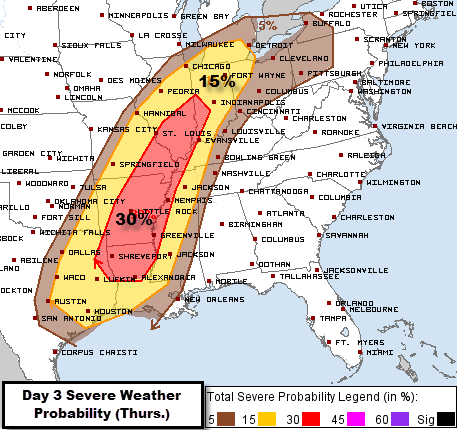 SPC graphic indicating the probability of severe weather within 25 miles of any point. Computer models still differ a bit on when the cold front will move through. The GFS model, and to an extent the NAM model, maintain a fairly progressive front, meaning that it maintains steady forward progress. They bring the front through in the midnight-3am timeframe early Thursday morning. The European model on the other hand has been very consistent in it's forecast that the front will slow down as it gets into the Mid-South and leans towards passage around dawn Thursday with slower progression east. The GFS solution is shown below, but some weight is given to the European model in our forecast as it has been consistent and also has shown skill in the medium range. We are leaning towards the NAM as a happy medium for frontal passage. 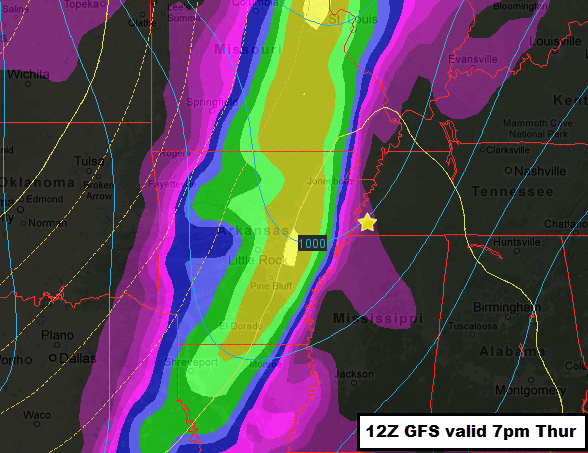 GFS computer model projection of the location of the cold front and associated precipitation at 1am Thursday. As for timing and threats, the main severe weather threat will be strong to damaging wind just ahead of the front, or probably around midnight, in association with an extensive squall line. Wind at 2-3,000' will be screaming at 65-75 mph and any of this wind that gets transported to the surface on thunderstorm downdrafts could cause damage. An isolated tornado threat will exist along the line as well, as wind shear will be sufficient. For several hours prior to the arrival of the line, or during the evening hours, scattered storms could form over the area. Any rogue storms ahead of the line could pose a threat for strong wind, large hail, or tornadoes, though the possibility of scattered storms forming is much lower than the squall line, which is near certain. All timing forecasts are still subject to change by a few hours either way. Finally, there is a fair amount of disagreement between the GFS and European models on how long the rain lasts behind the line (and subsequently how much we get), particularly on Thursday. The European indicates a wet day on Thursday, while the progressive GFS dries us out. 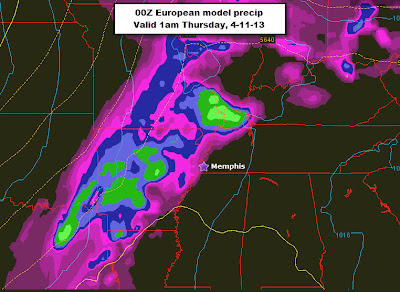 We'll indicate a likelihood of rain, mainly Thursday morning, but not quite to the extent of the Euro model. Flash flooding will be a concern overnight with the main batch of precip as amounts of 1-2" in a couple of hours is plausible.Another 1" is possible behind the front for totals in the 2-3" range from 6pm Wednesday to 6pm Thursday. 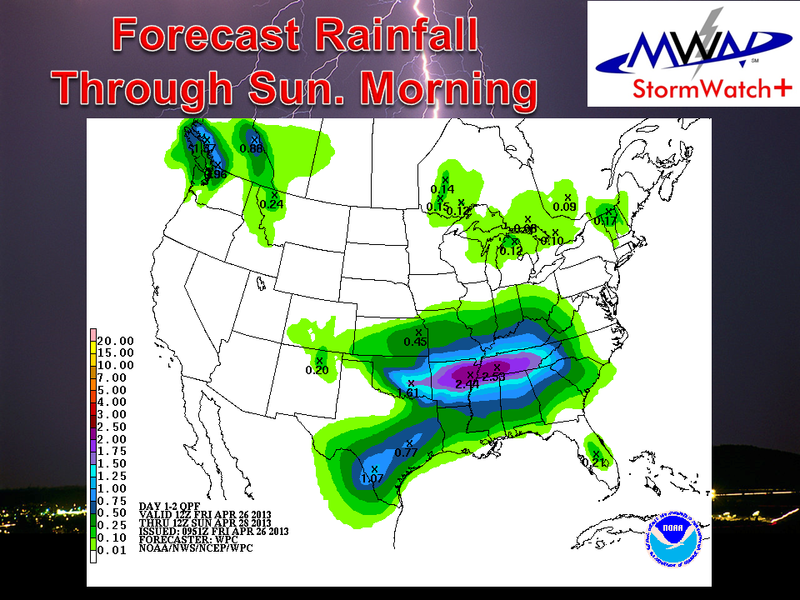 Projected rainfall totals from Wednesday evening through Thursday, courtesy NOAA. Amounts of 2-2.5" are indicated for the metro. In sum, while this is a storm system that deserves our attention, we do not expect a widespread tornado outbreak, though widespread 50-60 mph wind with areas of stronger wind are a good bet. Hail is possible but not likely, and the flash flooding concern is moderate. We'll continue to keep you updated over the next 48 hours and will nowcast the event itself on our social media channels. Prepare now for the possibility of severe weather after dark Wednesday night and how you will be notified if you are asleep when storms move through. Our StormWatch+ smartphone solution will wake you up if your location is in the path. All links are below. 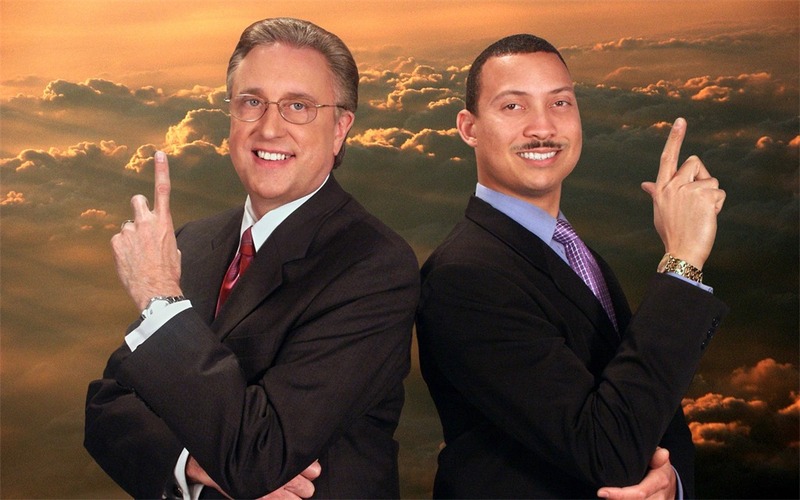 On Saturday, April 6, 2013, the Mid-South weather community, the ABC 24 family, and most of all his own family, lost a great man in Mark Walden. 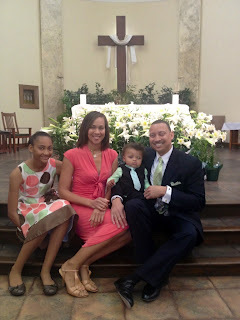 Mark, Chief Meteorologist at ABC 24 WPTY-TV, passed suddenly due to natural causes. Mark leaves a wife and young son, as well as a stepdaughter. In a bit of a twist, Mark became Chief Meteorologist at WPTY after the station suffered the loss of previous Chief Meteorologist Brian Teigland after a short illness in July 2008. Mark had served the Mid-South at WPTY since 1999, bringing his infectious smile to TV screens across the region, as well as to many public appearances, schools, and the charitable events that defined his public life. Though I only had the opportunity to meet Mark a couple of times as then-President of the local chapter of the American Meteorological Society, I had come to know him as a consummate professional, dedicated to his profession and willing to serve in a wide range of volunteer capacities. His passion was to keep Mid-Southerners informed when the weather called for a jacket or umbrella and safe when Mother Nature brought her full fury. We extend our deepest condolences to his family and friends, as well as to his co-workers, some of whom have seen this tragedy unfold twice in less than 5 years. Rest in Peace, Mark. You will be missed. SPC Outlooks: What does Slight, Moderate, High Risk mean? Many times when severe weather is expected, meteorologists will refer to an area having a certain "risk" of severe weather. When severe weather outbreaks are possible, the risk may be Slight, Moderate, or rarely High. So what do these terms mean? As an overview, the Storm Prediction Center (SPC), which is the NOAA/NWS organization responsible for severe weather forecasting in the U.S., issues convective outlooks covering the following 8 days. On days 1-3, maps are drawn that may contain one of 4 colored areas: General Thunderstorm, Slight, Moderate, and High Risk. General thunderstorm areas indicate the indicated zone will have a likelihood of thunderstorms which, for the most part, will be sub-severe. (Remember a thunderstorm must produce 1" hail, 58 mph wind, or tornadoes to be considered severe.) Slight, Moderate, and High risk areas represent progressively larger threat for organized severe storm episodes. SLIGHT RISK: Issued frequently during the peak severe weather season and implies that well-organized severe thunderstorms are expected but in relatively small numbers/coverage, or there is a small chance of a more significant severe event. Typically, Slight Risk areas produce scattered severe weather, including scattered wind damage or severe hail and possibly some isolated tornadoes. Significant severe events (75 mph wind, EF-2 tornadoes, or 2" hail) typically do not occur on Slight Risk days. MODERATE RISK: Issued much less frequently than Slight Risk areas (a couple of times a month during a typical severe weather season) and is usually reserved for days with substantial severe storm coverage, or an enhanced chance for a significant severe storm outbreak. A Moderate Risk implies a greater concentration of severe thunderstorms, and in most situations, greater magnitude of severe weather and greater forecaster confidence compared to a Slight Risk. 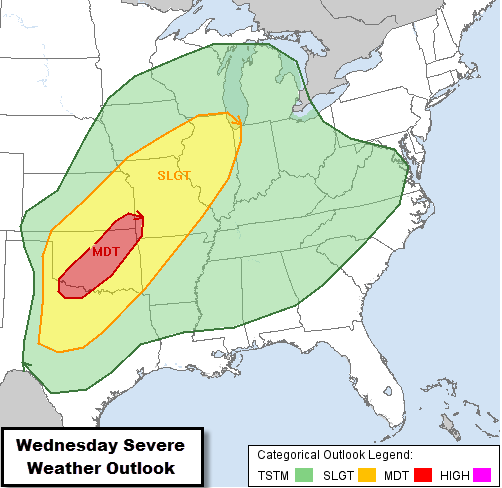 Typical Moderate Risk days include multiple tornadic supercells with very large hail, intense squall lines with widespread damaging winds, or in some cases, land-falling tropical storm systems. 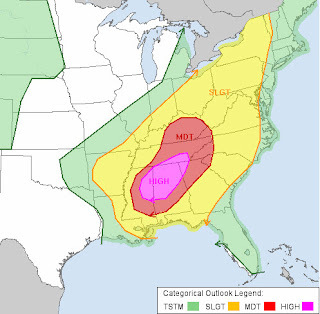 HIGH RISK: A High Risk area implies that a major severe weather outbreak is expected, with large coverage of severe weather and the likelihood of extreme severe storms (i.e., violent tornadoes or very damaging convective wind events). On most High Risk days, a major tornado outbreak is expected. The High Risk category is reserved for the most extreme events with the least forecast uncertainty, and is generally only used a few times each year. In fact, 51 High Risk days have occurred in the past 12 years (an average of about 4 a year). The forecast of Slight, Moderate, and High Risk is based on percentages indicating the probability of severe weather in the forecast area. 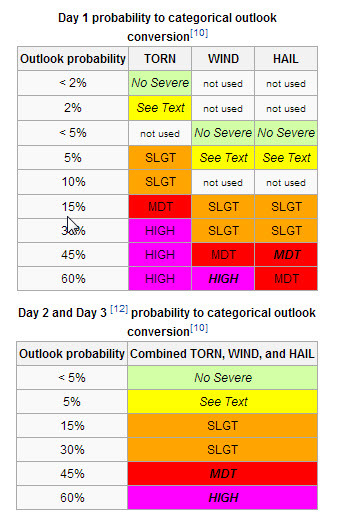 The tables below show the conversion from outlook probabilities to risk areas for Day 1 (today) and Days 2-3 (tomorrow, next day). As an example, if there is a 15% probability of a tornado within 25 miles of a point on Day 1, a Moderate Risk area will be issued. Graphic courtesy Wikipedia. 60% probability High Risk not used on Day 3. Hopefully this helps explain the risk terms used frequently by MWN and many other meteorologists! Learn more on the SPC website. While most Mid-Southerners are grateful for consecutive days in the 70s (especially on the weekend! ), Mid-South meteorologists and weather weenies are keenly aware that a persistent southerly flow of moisture off the Gulf of Mexico and warm temperatures are harbingers of convective weather. And those same people, including yours truly, have been closely monitoring a potent storm system that will sweep across the Mississippi Valley the middle of next week. This blog serves as a heads up to the rest of you that this strong spring cold front will bear watching in the coming days. The Storm Prediction Center is giving ample notice to the southern plains and mid/lower Mississippi Valley that a storm system that will move across the region next week will have the main ingredients in place to produce severe weather. There are several issues that must still be resolved, including exact timing of the front, that must be worked out. However, very warm air (75-80 degree temps locally for several days) and plenty of moisture from the Gulf courtesy of 4-5 days of south winds, plus the front and strong wind at all levels of the atmosphere, are the main ingredients necessary to produce what may become a widespread multi-day severe weather event. The graphic below highlights the areas that SPC believes are at the greatest threat for severe weather Tuesday and Wednesday. These are subject to change in the coming days, but likely more in the fine-scale details than in whether or not severe weather occurs. For the Mid-South, MWN is targeting Wednesday night as our most likely time for storms, some of which could easily be severe. The two main long-range models we use (GFS and European) are still several hours apart in their timing, but both indicate that severe weather is a good possibility. (Remember that model output is NOT a forecast, but one possibility of how a very complex situation might turn out.) With strong wind from the ground up to the jet stream, and sufficient "turning" of those winds in the lowest several thousand feet, the main concerns we have at this early date are damaging straight line winds (primarily) and tornadoes (secondarily). Hail is also a possibility, while widespread flooding does not at this time look too likely. 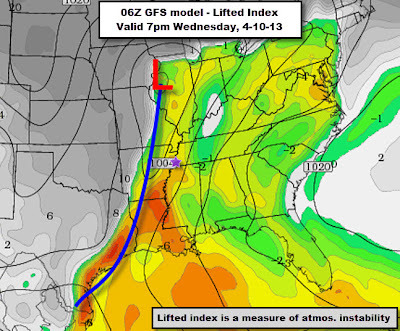 Latest European model output showing leading edge of an area of storms near the MS River overnight Wednesday night. Overnight model output from the GFS showing storms into the metro by early evening Wednesday, about 6-9 hours faster than the European model above. GFS model output of atmospheric instability, as measured by the Lifted Index. Plenty of instability would be in place to support severe thunderstorms if they arrive during the evening Wednesday, according to this model. We'll continue to monitor and let you know of any changes, as well as provide more specific details as they become clearer. Check in with us via our social channels listed below. However, between outdoor time and "spring cleaning," it would be a good idea to review severe thunderstorm and tornado safety tips and be prepared for the spring severe weather season that some doubted would EVER come after the 2nd coolest March in the past 40 years! Included in your severe weather safety plan should be multiple ways of getting severe weather warnings, including overnight. Do NOT count on sirens to warn you, especially if you are inside or asleep! (Why? Click here.) We highly recommend a smartphone app solution that will pinpoint warnings to the locations you select, as well as NOAA Weather Radio with battery backup. If you need a suggestion for a truly "smart" phone app, may we recommend our MemphisWeather.net app (mobile link) with StormWatch+ for Android and iPhone. It will wake you up if a dangerous storm is heading for your location, but not if it's headed for another part of your county. Temperatures averaged well below normal during March, which was no surprise to those hoping for a long string of spring weather! In fact, while not making the "Top 10" for coldest Marches on record, it was the 2nd coldest March in the past 40 years in Memphis (trailing only 1996)! For the first 3 months of the year, Memphis average temperature of 47.7 degrees is just shy of 1 degree above normal, thanks mainly to a warm January. Precipitation was below normal for March by about 1 3/4". For the year, precipitation is above normal by almost 3.5" due to a wet start to 2013. Two days recorded trace amounts of snowfall (2nd and 21st). No severe weather occurred in the Memphis metro for the month of March - which typically sees the beginning of our spring severe weather season. The average temperature for the month of March was 48.5 degrees, or 5.5 degrees below normal. The average high temperature was 57.8 degrees and the average low was 39.2. The coolest temperature of the month was 22 degrees on the 3rd, while the highest temperature was 77 degrees on the 15th. There were 6 days on which the low temperature fell to freezing or below and no temperature records tied or broken for the month. Precipitation for the month totaled 3.38", which was 1.78" below average. There were 11 calendar days with measurable rainfall, but only 1 day with at least 0.5" (1.07" on the 10th - see image below for Mid-South totals). Snowfall totaled a trace on March 2nd and 21st. The peak wind gust was 45 mph from the east on the 24th with an average wind speed for the month of 8.6 mph. Click here for a daily statistical recap for Memphis International Airport. The average March temperature at Cirrus Weather Solutions was 47.6 degrees with a maximum of 79.0 degrees on the 15th and a minimum of 19.7 degrees on the 3rd. March precipitation measured 2.79" via the Cirrus automated gauge and 2.69" in a manual gauge used for the CoCoRaHS program. 0.2" of snow was measured on the 1st-2nd and a trace on 21st. The measured peak wind gust was 29 mph on the 24th. Average relative humidity was 69%. Click here for a daily recap on MemphisWeather.net. For the month of March, the average temperature error in all MWN temperature forecasts was 2.68 degrees, lower than all available full-range computer model data and the National Weather Service forecasts. More than 55% of the MWN temperature forecasts for the month were within 2 degrees of the actual temperature. MWN's forecasts extend out five periods (2.5 days, or roughly 60 hours). For dewpoint accuracy, the MWN forecast averaged 2.88 degrees error and fell within 2 degrees of the actual dewpoint over 59% of the time. Historical accuracy statistics can be found here. Ready for spring? A cold few days with intermittent periods of rain showers will transition to a much more spring-like pattern beginning tomorrow. The graph below shows various weather parameters for the next 7 days from the overnight run of the GFS computer model. Click the image to enlarge it. The first thing to notice is the top red line which begins climbing tomorrow with the "peaks" getting higher (warmer afternoons) and the dips also getting higher (overnight lows much milder). In fact, our first 80 degree day of 2013 could be early next week! The arrows at the bottom represent the direction the wind is blowing (towards, not from) showing a wind shift from north to south on Friday night and remaining from the south well into next week. This major pattern shift will set the stage for possible severe weather by the middle of next week. MWN will keep you updated on the latest information as we get closer to that timeframe. In the meantime, you may want to check out StormWatch+ in the MWN app. There is no better way to get customized severe weather alerts for the locations YOU care about than smartphone technology. Cool and wet pattern this week, then a spring weekend on tap! Hopefully everyone enjoyed today's perfect spring weather because it won’t return until the weekend! As of Monday afternoon, a dry cold front was pushing south through the metro turning the wind around from the north and allowing cooler air to work into the area. On Tuesday into Wednesday, an upper level low will move out of the Rocky Mountains and into the Plains. At the same time a surface low will also develop over the Gulf and move along the Louisiana coastline pushing moisture northward. While heaviest rainfall will remain to our south closer to the track of the surface low, enough moisture will be pulled north into the metro to bring us scattered showers for the next several days. The metro will not see any severe weather from this system, but moderate rain is likely with forecast rainfall totals in the metro ranging for 1”-1.5” for the next 5 days. Rainfall projections through week's end show more than an inch expected across the metro. Severe weather outlooks from SPC indicate no thunder (green areas) expected in the metro this week. Showers will move into the metro after noon on Tuesday and continue off and on through the day with moderate rainfall possible in the late afternoon and evening hours. As the first wave of rain pulls away by Wednesday morning, we may see either a break or just scattered activity for a few hours Wednesday until the upper low approaches with a second wave of rainfall Wednesday night. The upper low will move by very close to the metro bringing us the heaviest rainfall of the event from late Wednesday night into the day on Thursday before pulling away to the northeast. Temps will remain in in the mid-50s for highs and around 40 for lows throughout the week with wind chills falling into the 30s during the overnight hours. Northeast wind (top) and cloud cover through the week will keep temps (bottom, shaded) cooler than average. By the weekend, a southerly wind and abundant sunshine will push temps into the 70s. On Friday, high pressure builds into the metro with a return of sunny skies and temps in the mid-60s. Friday night, high pressure moves east of the metro turning our winds around from the south. On Saturday and Sunday, highs will climb into the mid and upper 70s making for a beautiful first weekend of April complete with mostly sunny skies. We may even see some flowers beginning to bloom this weekend! The second week of April is looking stormy and could bring our first chances of spring severe weather that the Mid-South is known for. We'll have more on this pattern change as the week draws to a close. In the meantime, keep the warm clothes and umbrellas handy for a few days and look forward to a gorgeous spring weekend ahead! We'll keep you updated with the latest via our social media channels and mobile apps (links below). Click here for the complete MWN Forecast.